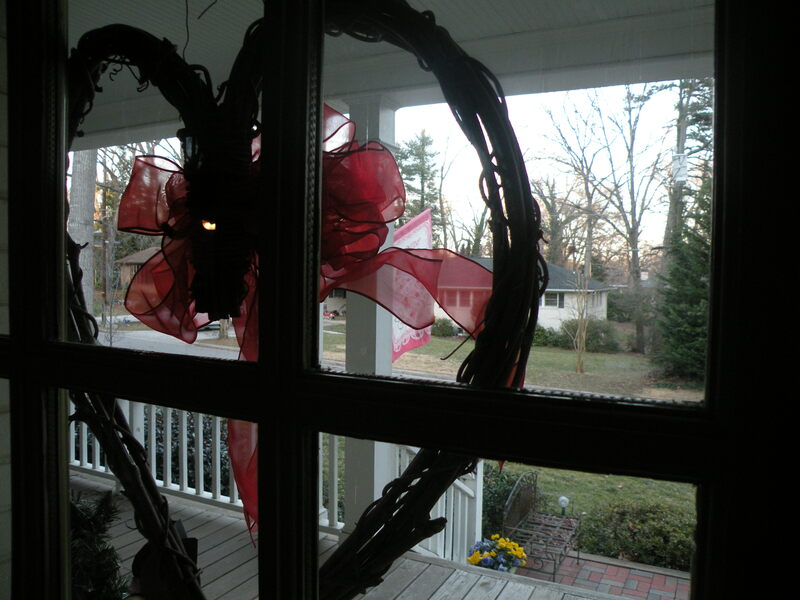 I almost wrote this post in February (hence the attempt at an avant-garde photo of the Tanner house Valentine’s wreath). It recently became relevant again. Danny says he could take all the posts I’ve “almost written” and we’d have two blogs: The Real Full House blog and The Posts That Almost Made It Out Of Jesse’s Head And Onto The Real Full House blog. He’s a funny guy. But point taken–I’m not quite as good as Danny with the consistency piece. Another thing I’m not as good as Danny at is listening. The guy is a human sounding board. I can’t imagine what it’s like for him having to feign interest in all the inane sports stuff I throw at him. Not that I think he’s a phony–he tells me his general interest in sports has grown (and I can attest that his knowledge has), and I believe him. Perhaps I just find it impossible for anyone else to care about the difference between the NBA and college basketball traveling rule. But you know what I’m good at? Talking. So I prattle on. And, even while cooking dinner, he plays the role of the engaged listener well, maintaining eye contact (glancing down briefly to empty the trash) and asking follow-up questions. The same goes with stories about my weekends, my triumphs and frustrations with trying to start and grow and small business with my good friend, and the stupid MTV shows I watch. I don’t mean to suggest he gets nothing out of it–I do enjoy sharing music with him and I know he likes adding to his collection of tunes. I can’t yet tell if he’s sold on Chapelle’s Show, which I’ve been making him watch as Comedy Central replays them in summer, but he takes my word for it when I tell him the show was seminal, and thus puts up with the episodes I make him watch. Some of my favorite conversations with him are about God. We talk about things we’ve read, or heard in church, or had explained to us but disagreed with. We both approach the subject with curiosity and humility. As Danny will attest, when I am certain I am right about something I will plow through any argument to the contrary (and enjoy the challenge along the way–perhaps a little too much). But most times these conversations involve phrases, “I think what makes the most sense in my head,” and “what I try to do is…”. The discussions always have the feel of two people trying to help each other learn more about a vastly complex subject, and I like that. How do you turn to a guy who lost his wife, best friend, lover, and mother to his three beautiful daughters….and complain about a broken heart?